The Windows Defender ATP sensor requires Microsoft Windows HTTP (WinHTTP) to report sensor data and communicate with the Windows Defender ATP service. The embedded Windows Defender ATP sensor runs in system context using the LocalSystem account. The sensor uses Microsoft Windows HTTP Services (WinHTTP) to enable communication with the Windows Defender ATP cloud service. If you're using Transparent proxy or WPAD in your network topology, you don't need special configuration settings. For more information on Windows Defender ATP URL exclusions in the proxy, see Enable access to Windows Defender ATP service URLs in the proxy server. 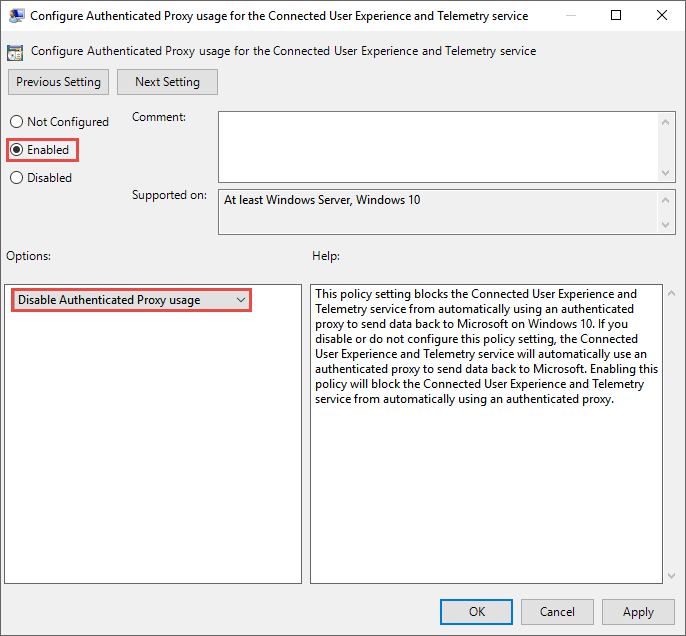 Configure a registry-based static proxy to allow only Windows Defender ATP sensor to report diagnostic data and communicate with Windows Defender ATP services if a computer is not be permitted to connect to the Internet. The policy sets two registry values TelemetryProxyServer as REG_SZ and DisableEnterpriseAuthProxy as REG_DWORD under the registry key HKLM\Software\Policies\Microsoft\Windows\DataCollection. The registry value DisableEnterpriseAuthProxy should be set to 1. Use netsh to configure a system-wide static proxy. This will affect all applications including Windows services which use WinHTTP with default proxy. Laptops that are changing topology (for example: from office to home) will malfunction with netsh. Use the registry-based static proxy configuration. a. Go to Start and type cmd. b. Right-click Command prompt and select Run as administrator. URLs that include v20 in them are only needed if you have Windows 10, version 1803 or later machines. For example, us-v20.events.data.microsoft.com is only needed if the machine is on Windows 10, version 1803 or later. If a proxy or firewall is blocking anonymous traffic, as Windows Defender ATP sensor is connecting from system context, make sure anonymous traffic is permitted in the previously listed URLs. If you network devices don't support the URLs white-listed in the prior section, you can use the following information. You can find the Azure IP range on Microsoft Azure Datacenter IP Ranges. As a cloud-based solution, the IP range can change. It's recommended you move to DNS resolving setting. Verify the proxy configuration completed successfully, that WinHTTP can discover and communicate through the proxy server in your environment, and that the proxy server allows traffic to the Windows Defender ATP service URLs. Download the connectivity verification tool to the PC where Windows Defender ATP sensor is running on. Extract the contents of WDATPConnectivityAnalyzer on the machine. Extract the WDATPConnectivityAnalyzerResult.zip file created by tool in the folder used in the HardDrivePath. Open WDATPConnectivityAnalyzer.txt and verify that you have performed the proxy configuration steps to enable server discovery and access to the service URLs. 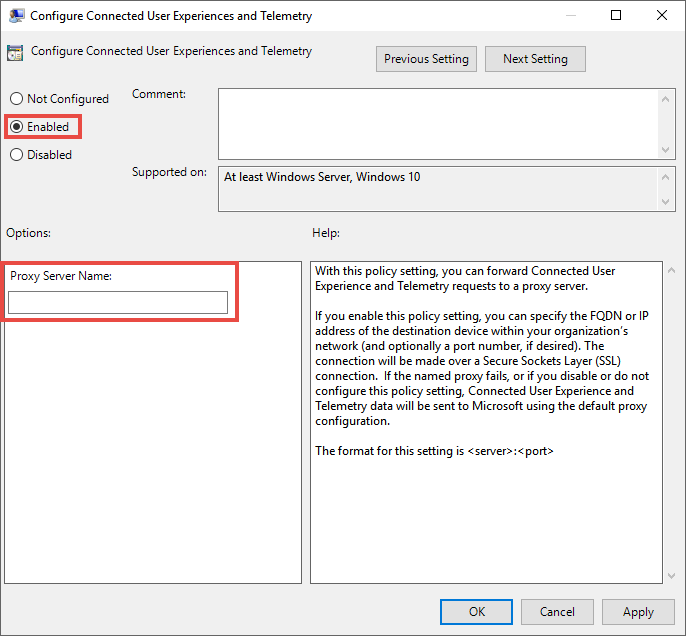 If at least one of the connectivity options returns a (200) status, then the Windows Defender ATP client can communicate with the tested URL properly using this connectivity method. However, if the connectivity check results indicate a failure, an HTTP error is displayed (see HTTP Status Codes). You can then use the URLs in the table shown in Enable access to Windows Defender ATP service URLs in the proxy server. The URLs you'll use will depend on the region selected during the onboarding procedure. When the TelemetryProxyServer is set, in Registry or via Group Policy, Windows Defender ATP will fall back to direct if it can't access the defined proxy.